Las zapatas CDS están diseñadas para generar una onda transversal de 30 grados y una longitudinal de 70 grados en el acero para medir el tamaño de las fisuras que se extienden hasta las superficies internas por medio de la técnica 30-70-70. The 30-70-70 crack detection technique uses a single element transducer with a CDS wedge for detection and sizing of ID connected cracks. This technique uses a combination of three waves for sizing flaws of different depths. An OD creeping wave creates a 31.5 degree indirect shear, (red in diagram to the left), wave which mode converts to an ID creeping wave; this will produce a reflected signal on all ID connected cracks. A 30 degree shear wave, (yellow in diagram to the left), will reflect off the material ID at the critical angle and mode convert to a 70 degree longitudinal wave; a signal will be received by the transducer on mid-wall deep cracks. A 70 degree longitudinal wave, (blue in diagram to the left), will reflect off the tip of a deep wall crack. Based on the presence or absence of these three waves, both detection and sizing of ID connected cracks is possible. 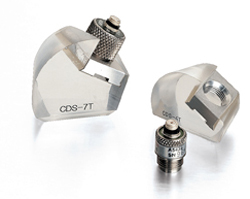 CDS Wedges are used in the "30-70-70" technique for crack detection and sizing. They are compatible with our replaceable miniature screw-in angle beam transducers, making them an economical alternative to other commercially available products.